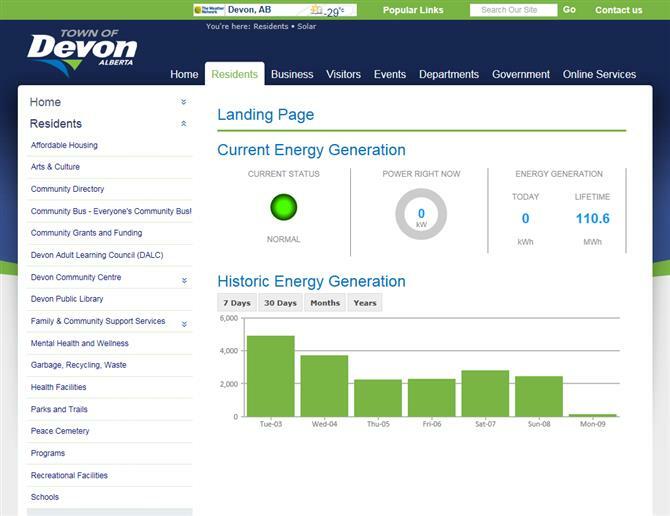 The Town of Devon's new solar tracking and energy storage system on top of their community centre is the focus of another DotNetNuke module for Webmonton Media. The purpose of the page and the project is to engage the citizens of Devon in using and supporting solar power in their community. The solar panels send their reports in JSON (A data format) to the server and ShiftUP Consulting reads them, stores them in a permanent database and displays it on the screen. The growing graphs and pie charts are created using canvasjs and add to the engagement on the page.